Ok, so can we all agree that the Star Wars prequel trilogy, was a little…...well...can we just say there were some high and low points? Even your kid said a few times he had “mixed feelings” about the movies. BUT…..you can’t deny that when those Clone Troopers burst onto the scene on Geonosis at the end of Episode II, your world was rocked. And so was your little guy’s. Well, now he can relive one of the best things to come out of the prequel trilogy: the ARF troopers. 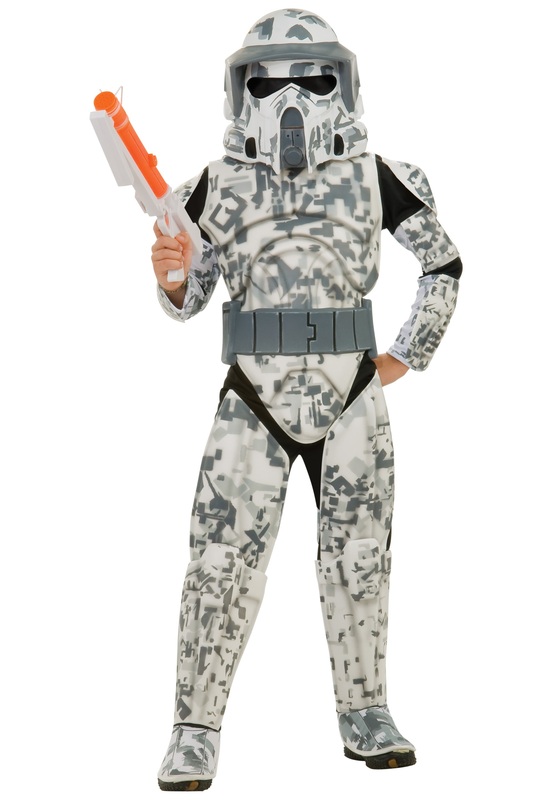 In this Kid’s Deluxe Advanced Recon Force Trooper Costume, he’ll feel like he’s among the best of the best of the clone troopers, hiding deep behind enemy lines and reporting back crucial information about opposing strategies. He can practice hiding among the shadows, moving like a ghost around the perimeter, tracking and tracing troop movement, and working with General Kenobi himself to determine the ideal attack strategy. Everyone knows your little guy’s role on the battlefield is maybe the most crucial for victory...and the most dangerous. We’re pretty sure that’s the best part in his mind. So don’t miss out on this ARF outfit. Your tiny reconnaissance officer will be so happy to know he’s been selected to be a part of the most important and exciting clone trooper assignment under the command of some of the best Jedi Generals, disappointing movies notwithstanding.